Made of pieces of silk brocade, oshie pictures are created by cutting apart pieces of an original drawing that has been transferred onto heavy paper, cutting these same shapes out of brocades, and stuffing the space between the silk and the paper, assembling these pieces back into the original picture. 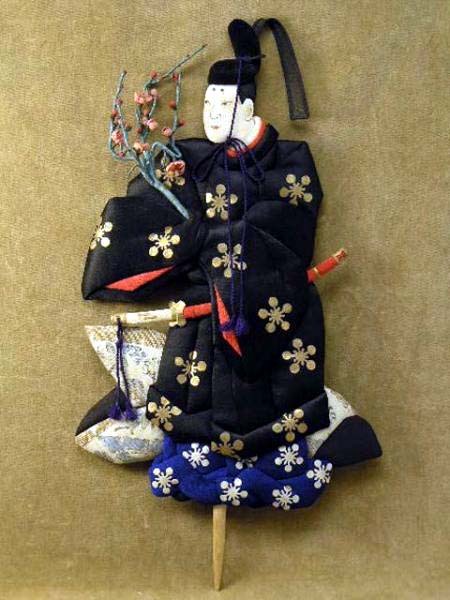 The technique is often seen in wall pictures and on hagoita, elaborate versions of paddles used in the game of hanetsuki, which are popular today as decorative pieces. This oshie shows Kan Shôjô in the drama "Sugawara Denju Tenarai Kagami".